There is no native way of synchronizing your Outlook tasks to an Android-based phone or pad directly as of today. 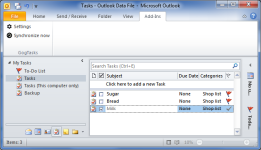 You can synchronize your e-mail and calendar using the Outlook Exchange protocol, but that protocol does not support tasks. Many developers have made efforts to work around that issue and created third party tools that allow you to synchronize via cloud services such as Remember the Milk or ToodleDo. These services will all get the job done, but if you are a Google Mail and Calendar user like me, the more natural cloud service for my tasks would be the Google Task list. This is the alternative I will present in this article. 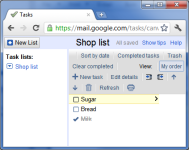 There are several tools for Android devices that will let you work with Google Tasks, for example GTasks and Google Tasks Organizer (GTO). I'm using GTask, so that's what I'll be using as an example here. I'm sure there are even more alternatives, but GTasks gets the job done. The free version is ad-based, but you can upgrade for ~$8. That said, the price of GTO is only $3, but it does not have widget support (as of now). A widget is really useful if you ask me. Then you can have the most pressing task list "just a flick away" at one of your home screens. See the screenshot to the right for an example. As soon as you've configured GTasks (or GTO) and GogTasks to sync against your GMail account, there's not really much to it. Synchornize your tasks, and they will be available wherever you are - on the bus with your phone/pad, by your work computer with Outlook, or from the internet café in Amsterdam when your there to... visit your aunt. Thanks for this. Syncing between Outlook, Google and my android device is just what I have been looking for. After just a few minutes use since installing it, I am loving it. Will be doing more testing over the coming days. In any case, they regularly think that its testing to make the application work easily on various Android gadgets with a similar arrangement of APIs.